ARMONK, NY – 17 July 2017: IBM (NYSE: IBM) today unveiled IBM Z, the next generation of the world’s most powerful transaction system, capable of running more than 12 billion encrypted transactions per day. The new system also introduces a breakthrough encryption engine that, for the first time, makes it possible to pervasively encrypt data associated with any application, cloud service or database all the time. IBM Z’s new data encryption capabilities are designed to address the global epidemic of data breaches, a major factor in the $8 trillion cybercrime impact on the global economy by 2022 Of the more than nine billion data records lost or stolen since 2013, only four percent were encrypted, making the majority of such data vulnerable to organized cybercrime rings, state actors and employees misusing access to sensitive information. 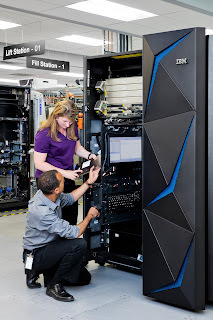 In the most significant re-positioning of mainframe technology in more than a decade, when the platform embraced Linux and open source software, IBM Z now dramatically expands the protective cryptographic umbrella of the world’s most advanced encryption technology and key protection. The system’s advanced cryptographic capability now extends across any data, networks, external devices or entire applications – such as the IBM Cloud Blockchain service – with no application changes and no impact on business service level agreements. to have a significant and immediate impact on global data security." A recent study found that extensive use of encryption is a top factor in reducing the business impact and cost of a data breach. To put that in context, the IBM X-Force Threat Intelligence Index reported that more than four billion records were leaked in 2016 (a 556 percent increase from 2015). However, encryption is often largely absent in corporate and cloud data centers because current solutions for data encryption in x86 environments can dramatically degrade performance (and thus user experience), and can be too complex and expensive to manage. As a result, only about two percent of corporate data is encrypted today, while more than 80 percent of mobile device data is encrypted. IBM Z pervasive encryption reflects a call to action on data protection articulated by Chief Information Security Officers and data security experts worldwide, and more than 150 IBM clients around the world who participated and provided feedback in IBM Z’s system design over three years. · Pervasive encryption of data – all the time. IBM Z makes it possible, for the first time, for organizations to pervasively encrypt data associated with an entire application, cloud service or database in flight or at rest with one click. The standard practice today is to encrypt small chunks of data at a time, and invest significant labor to select and manage individual fields. This bulk encryption at cloud scale is made possible by a massive 7x increase in cryptographic performance over the previous generation z13 – driven by a 4x increase in silicon dedicated to cryptographic algorithms. This is 18x faster compared to x86 systems (that today only focus on limited slices of data) and at just five percent of the cost compared to x86-based solutions. · Tamper-responding encryption keys. A top concern for organizations is protection of encryption keys. In large organizations, hackers often target encryption keys, which are routinely exposed in memory as they are used. Only IBM Z can protect millions of keys (as well as the process of accessing, generating and recycling them) in “tamper responding” hardware that causes keys to be invalidated at any sign of intrusion and can then be reconstituted in safety. · Encrypted APIs. IBM z/OS Connect technologies can make it easy for cloud developers to discover and call any IBM Z application or data from a cloud service, or for IBM Z developers to call any cloud service. IBM Z now allows organizations to encrypt these APIs – the digital glue that links services, applications and systems – nearly 3x faster compared to alternatives based on x86 systems. “The pervasive encryption that is built into, and is designed to extend beyond, the new IBM Z really makes this the first system with an all-encompassing solution to the security threats and breaches we’ve been witnessing in the past 24 months,” said Peter Rutten, analyst at IDC’s Servers and Compute Platforms Group. IBM Z, deeply integrated with IBM Security software, automates and dramatically streamline security and compliance processes. For example, auditors are expected to manually inspect and validate the security of databases, applications and systems. Organizations can now immediately demonstrate that data within of scope of compliance is protected and the keys are secure. This can significantly reduce the mounting complexity and cost of compliance for auditors. The system also provides an audit trail showing if and when permissioned insiders accessed data. · New microservices and applications that enable clients to maximize the value from security-rich on-premises enterprise systems in real time. Clients can now co-locate applications to optimize qualities of services that are priced competitively with public cloud and on-premises platforms. • Application development and test with the freedom to triple capacity of all development environments on z/OS to support latest DevOps tooling and processes. Clients can triple capacity with no increase in monthly license charge. • Payment systems pricing based on the business metric of payments volume a bank processes, not the available capacity. This gives clients much greater flexibility to innovate affordably in a competitive environment, particularly in the fast-growing Instant Payment segment. These precedent-setting Container Pricing options are designed to give clients the predictability and transparency they require for their business. · 87 percent of all credit card transactions and nearly $8 trillion payments a year. · 29 billion ATM transactions each year, worth nearly $5 billion per day. · Four billion passenger flights each year. · More than 30 billion transactions per day – more than the number of Google searches every day. · 68 percent of the world's production workloads at only six percent of the total IT cost. Banks and others in the financial services industry process thousands of transactions per second to keep the world’s financial systems running. The mainframe is more critical than ever for reliably handling high volumes of transaction data. Ninety-two of the world’s top 100 banks rely on the IBM mainframe because of its ability to efficiently process huge volumes of transactions. To help financial services organizations more effectively compete in the cloud era, enormous amounts of sensitive data produced by transactions can now be better protected against fraud and cybercrime, analyzed, and monetized using IBM Z – without causing disruption of day-to-day operations. For banks, this means encryption at the click of a button -- even while applications are running -- and the ability to migrate data from unencrypted to encrypted with no impact to service level agreements. The IBM Z, the next generation of IBM's industry-leading CMOS mainframe technology, features the industry’s fastest microprocessor, running at 5.2GHz, and a new scalable system structure that delivers up to a 35 percent capacity increase for traditional workloads and up to a 35 percent capacity increase for Linux workloads compared to the previous generation IBM z13. As part of today’s announcement, IBM also previewed new z/OS software that provides foundational capabilities for private cloud service delivery, enabling a transformation from an IT cost center to a value-generating service provider. When available, these capabilities will include the support of workflow extensions for IBM Cloud Provisioning and Management for z/OS and real-time SMF analytics infrastructure support. Learn more about the IBM Z portfolio , the new IBM z14 mainframe or IBM Z enterprise security . · طفرة تكنولوجية كبرى: تشفير واسع الإنتشار للبيانات، طول الوقت وعلى أي نطاق. · تنظيم حماية البيانات، لوائح مجلس الإحتياطي الفيدرالي وما يستحدث من لوائح أخرى. · تعمل على تشفير البيانات أسرع بـ18 مرة من المنصات x86 وبتكلفة تبلغ 5% من التكلفة الحالية. · يوفر تسعير حاوي رائد للحلول الجديدة، مثل حلول الدفع الفوري. كشفت شركة آي بي أم (المدرجة في بورصة نيوريورك تحت الرمز: آي بي أم) اليوم عن نظام IBM Z، الجيل القادم من نظام المعاملات الأقوى في العالم، القادر على إدارة أكثر من 12 مليار معاملة مشفرة يوميا. يقدم النظام الجديد أيضا محرك تشفير متطور والذي يتيح، ولأول مرة وعلى نحو واسع الإنتشار، إمكانية تشفير البيانات المرتبطة بأي تطبيق، أو خدمة حوسبة سحابية أو قاعدة بيانات طول الوقت. وتعد هذه الخطوة من أهم الخطوات التي حدثت فى مسار تكنولوجيا أجهزة الكمبيوتر المركزية خلال أكثر من عقد من الزمان، حينما تبنت المنصة نظام لينكس والبرمجيات مفتوحة المصدرOpen Source، تتم الآن من خلال نظام IBM Z وبشكل كبير توسيع نطاق الحماية والتشفير لتكنولوجيا التشفير الأكثر تقدما وفعالية في مجال حماية البيانات في العالم. إن القدرة التشفيرية المتقدمة للنظام تمتد الآن لتشمل أي بيانات أو شبكات أو أجهزة خارجية أو تطبيقات كاملة - مثل خدمة آي بي أم السحابية للبلوك تشين Blockchain –ومن دون إحداث تغييرات في التطبيق أو التأثير على اتفاقيات مستوى خدمة الأعمال. قال روس ماوري، المدير العام لنظام IBM Z: "إن الغالبية العظمى من البيانات المسروقة أو المسربة اليوم متاحة دون حماية ويسهل استخدامها لأن التشفير كان صعبا ومكلفا للغاية للقيام به على نطاق واسع". لقد أنشأنا محرك حماية البيانات لعصر الحوسبة السحابية ليكون له تأثير كبير وفوري على أمن البيانات العالمي". توصلت إحدى الدراسات مؤخراً إلى أن الاستخدام الواسع للتشفير يشكل عاملاً رئيساً في الحد من تأثر الأعمال وتكلفة انتهاك سرية البيانات. ولوضع ما سبق في السياق، فقد أفاد مؤشر الاستخبارات (IBM X-Force) حول تهديدات سرقة البيانات أن أكثر من أربعة مليارات من السجلات قد تم تسريبها في عام 2016 (أي بزيادة 556 في المئة عن عام 2015). ومع ذلك، فغالبا ما تفتقد مراكز البيانات بالمؤسسات والأخرى الخاصة بخدمات الحوسبة السحابية وبشكل كبير إلى وجود التشفير لأن الحلول الحالية لتشفير البيانات في البيئات ذات المعمارية x86 يمكن أن تؤدي إلى تدهور كبير في الأداء (وبالتالي في تجربة المستخدم)، ويمكن أن تكون إدارتها معقدة جدا ومكلفة أيضاَ. ونتيجة لذلك، يتم حالياً تشفير حوالي 2 في المئة فقط من بيانات الشركات، في حين يتم تشفير أكثر من 80 في المئة من بيانات أجهزة الهاتف النقال. ويعكس التشفير واسع الإنتشار في نظام IBM Z دعوة إلى العمل بشأن حماية البيانات يفصح عنها كبار مسؤولي أمن المعلومات وخبراء أمن البيانات في جميع أنحاء العالم، وأكثر من 150 عميل لشركة آي بي أم حول العالم ممن شاركوا وقدموا آرائهم في تصميم نظام IBM Z على مدى ثلاث سنوات. • تشفير واسع الإنتشار للبيانات – طوال الوقت. حيث يتيح نظام IBM Z للشركات، ولأول مرة، إمكانية تشفير بشكل واسع الإنتشار للبيانات المرتبطة بتطبيق كامل، أو خدمة حوسبة سحابية أو قاعدة بيانات سواء أثناء فترة الإرتحال أو أثناء فترة الراحة وبضغطة واحدة. وطبقاً للممارسة المتبعة حالياً يتم تشفير أجزاء صغيرة من البيانات في وقت معين باستخدام عمالة كبيرة لإختيار وإدارة المجالات الفردية. وتتم إتاحة عملية التشفير لمجموعة أو جملة كبيرة من البيانات على نطاق السحابة الإلكترونية من خلال زيادة هائلة في أداء التشفير بمقدار سبعة أضعاف عنها في الجيل السابق Z13 - مدفوعا بزيادة بمقدار أربعة أضعاف في السيليكون المخصص لخوارزميات التشفير. ويعتبر ذلك أسرع ب18 مرة مقارنة مع أنظمة x86 (التي تركز اليوم فقط على شرائح محدودة من البيانات)، وبتكلفة تبلغ خمسة في المئة فقط من التكلفة مقارنة مع الحلول القائمة على أنظمة x86. • مفاتيح التشفير المتصدية للتلاعب بالبيانات. تعد حماية مفاتيح التشفير من الشواغل الكبرى للشركات. فغالبا ما تكون مفاتيح التشفير هدفاً لمخترقي الشبكات في الشركات الكبرى، حيث تكون عرضة للاختراق بشكل روتيني في الذاكرة عند استخدامها. يمكن من خلال نظام IBM Z فقط حماية الملايين من المفاتيح (وكذلك عملية الوصول إليها، وتوليدها وإعادة تدويرها) داخل الأجهزة "المتصدية للتلاعب" والتي تعمل على إبطال المفاتيح عند ظهور أي علامة على محاولة التسلل أو الاختراق، حيث يمكن بعد ذلك إعادة تشكيل تلك المفاتيح في الظروف الآمنة. • الواجهات المشفرة لبرمجة التطبيقات. تتيح تقنيات IBM z/OS Connect لمطوري برامج وخدمات الحوسبة السحابية استكشاف واستدعاء أي تطبيق أو بيانات على نظام IBM Z من خدمة سحابية، وكذلك تتيح لمطوري نظام IBM Z استدعاء أي خدمة سحابية. ويسمح نظام IBM Z الآن للشركات بتشفير واجهات برمجة التطبيقات تلك - الغراء الرقمي الذي يربط بين الخدمات والتطبيقات والأنظمة – أسرع بحوالي 3 مرات مقارنة بالبدائل القائمة على أنظمة x86. وقال بيتر روتن، المحلل في مجموعة IDC للخوادم ومنصات الحوسبة بأن "نظام التشفير الجديد الواسع الإنتشار IBM Z والذي قد تم بناؤه، وتصميمه ليمتد طويلاً إلى ما هو أبعد، يعتبر بذلك النظام الأول من نوعه الذي يوفر حلاً شاملاً للتهديدات الأمنية والإنتهاكات التي شهدناها خلال ال 24 شهرا الماضية". يعمل نظام IBM Z المدمج بعمق مع برمجيات آي بي أم الخاصة بأمن المعلومات على ميكنة وتبسيط العمليات الأمنية وعمليات الإمتثال بشكل مذهل. على سبيل المثال، من المتوقع أن يقوم المدققون يدوياً بالفحص والتحقق من أمن قواعد البيانات والتطبيقات والأنظمة. ويمكن للشركات الآن أن تتثبت على الفور من أن البيانات ضمن نطاق الامتثال محمية وأن المفاتيح آمنة. وهذا يمكن أن يقلل بشكل ملحوظ من التعقيد المتزايد ويحد من تكلفة عملية الامتثال والمدققين القائمين عليها. يوفر النظام أيضا سجل للمراجعة والتدقيق يبين ما إذا كان قد تم السماح للمطلعين بالدخول إلى البيانات ومتى تم ذلك. • الخدمات المتناهية الصغر الجديدة والتطبيقات التي تمكن العملاء من تحقيق أقصى قدر من القيمة الخدمية من خلال أنظمة المؤسسات المحلية التي يتحقق بها قدر كبير من الأمن وبشكل فوري. يمكن للعملاء الآن المشاركة في تحديد التطبيقات لتحسين نوعيات الخدمات التي يتم تسعيرها بأسعار تنافسية في وجود السحابة الإلكترونية العامة والمنصات المحلية. • تطوير التطبيقات والاختبار مع حرية مضاعفة القدرة إلى ثلاثة أضعاف قدرة جميع بيئات التطوير على z/OS وذلك لدعم أحدث ادوات وعمليات المطورين (DevOps). يمكن للعملاء مضاعفة القدرة إلى ثلاث أضعاف مع عدم زيادة رسوم الترخيص الشهرية. • تسعير أنظمة الدفع على أساس مقياس الأعمال من حجم المدفوعات الذي يتعامل معه البنك، وليس القدرة المتاحة. وهذا يعطي العملاء مرونة أكبر بكثير للابتكار بأسعار معقولة في بيئة تنافسية، ولا سيما في قطاع الدفع الفوري السريع النمو. تم تصميم خيارات التسعير الحاوية هذه والمحددة فيما سبق، لتزويد العملاء بإمكانية التنبؤ ومنحهم الشفافية التي يحتاجونها لأعمالهم. • 87 في المائة من جميع معاملات بطاقات الائتمان وما يقرب من 8 تريليون دولار من المدفوعات سنويا. • 29 مليار معاملة عبر الصراف الآلي سنويا، بقيمة تقارب 5 مليارات دولار يوميا. • أربعة مليارات رحلة لنقل الركاب كل عام. • أكثر من 30 مليار معاملة يوميا - أي أكثر من عدد عمليات البحث على موقع جوجل كل يوم. • 68 في المائة من حجم الأعمال الإنتاجية العالمية بتكلفة لا تتجاوز نسبتها 6 في المائة من إجمالي تكلفة تكنولوجيا المعلومات. تدير البنوك وغيرها في صناعة الخدمات المالية الآلاف من المعاملات في الثانية الواحدة للحفاظ على استمرارية عمل الأنظمة المالية حول العالم. وقد أصبح جهاز الحاسوب (الكمبيوتر) المركزي أكثر أهمية من أي وقت مضى من أجل التعامل بشكل موثوق مع كميات كبيرة من بيانات المعاملات. ويعتمد اثنان وتسعون من أكبر 100 بنك في العالم على أجهزة الكمبيوتر المركزية الكبيرة لشركة آي بي أم نظراً قدرتها على معالجة كميات ضخمة من المعاملات بكفاءة. وبغرض مساعدة المنظمات أو الشركات العاملة في الخدمات المالية على المنافسة بشكل أكثر فعالية في عصر الحوسبة السحابية، أصبح الآن من الممكن حماية كميات هائلة من البيانات الحساسة التي تنتجها المعاملات على نحو أفضل من عمليات الإحتيال والجرائم الإلكترونية عبر شبكة الإنترنت وتحليل تلك البيانات واستثمارها باستخدام نظام IBM Z – وذلك من دون التسبب في تعطيل العمليات اليومية. يعني ذلك بالنسبة للبنوك، التشفير بضغطة زر - حتى أثناء تشغيل التطبيقات – ويعني القدرة على تحويل البيانات من بيانات غير مشفرة إلى أخرى مشفرة وبدون أي تأثير على اتفاقات مستوى الخدمة. نظام IBM Z، الجيل القادم من تكنولوجيا آي بي أم الرائدة في مجال صناعة أجهزة الكمبيوتر المركزية القائمة على تكنولوجيا CMOS، يأتي بعدة ميزات أولها المعالج الدقيق الأسرع في هذه الصناعة، والذي يعمل بتردد 5.2 جيجاهرتز، وهيكل جديد للنظام قابل للتطوير يوفر زيادة تصل إلى 35 في المئة عن أعباء العمل التقليدية، وزيادة تصل إلى 35 في المئة في حجم أعمال لينكس مقارنة مع الجيل السابق IBM Z13. وكجزء من إعلان اليوم، قامت شركة آي بي أم أيضا باستعراض برنامجها الجديد z/OS والذي يوفر قدرات تأسيسية لتقديم الخدمات السحابية الخاصة، مما يمكن من التحول من مركز تكلفة لتكنولوجيا المعلومات إلى مزود خدمة مولد للقيمة. وستتضمن هذه الإمكانيات، عند توفرها، دعم إضافات سير العمل الخاصة بالتزويد بخدمات الحوسبة السحابية IBM Cloud وإدارة z/OS ودعم البنية الأساسية لتحليلات (مرافق إدارة النظام SMF) في الوقت الفعلي. يمكن لنظام التمويل العالمي من آي بي أم مساعدة العملاء المؤهلين للائتمان في الحصول على نظام IBM Z الجديد، وتخفيض التكلفة الإجمالية لملكية النظام، وتسريع عائد الاستثمار. تتوفر عروض التمويل العالمي من آي بي أم لحلول أجهزة الكمبيوتر المركزية من خلال آي بي أم وشركائها التجاريين، وتوفر شروطا وأحكام على قدر من المرونة يمكن تخصيصها حسب الطلب لمواءمة التكلفة مع فوائد المشروع أو احتياجات العميل الأخرى. تعرف على المزيد حول الحافظة الخاصة بنظام IBM Z، أو جهاز الكمبيوتر المركزي الجديد IBM z14 أو أمن المؤسسة عبر نظام IBM Z.